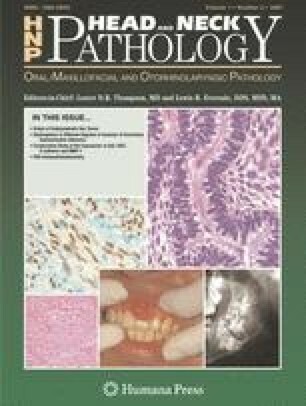 Epidemiologic, clinical, morphologic and molecular evidence show that high risk HPV, particularly type 16, is a prerequisite for some carcinomas of the upper aerodigestive tract (UADT), particularly tonsil and base of tongue. Sexual transmission is an important mode of infection while tobacco use and excessive drinking are not considered risk factors. HPV + tumors are distinct clinically and pathologically. They are more common in young patients (<40 years) with a male to female ratio of 4:1. They usually present as a small or occult primary tumor with advanced neck disease. Microscopically they are non-keratinizing squamous cell carcinomas with basaloid features, excessive mitosis and comedo type necrosis. The tumors have a distinct immunohistochemical profile characterized by strong and diffuse p16 reactivity, low or negative p53 staining and high Ki67 labeling scores. HPV + carcinomas are more radio-sensitive and have a better prognosis than the classical keratinizing SCC of the UADT. An anti-HPV vaccine has recently been made available for prevention of cervical cancer. The impact of the vaccine on the prevalence of HPV related carcinomas of the UADT is currently not known but likely beneficial.